Ewwwwww, what is it??? Click the image to find out! This page contains responses to miscellaneous questions we get about all kinds of fish. Click on a question to see the response. What fish species do you study at the NEFSC? Below are categories of fish, with a list of all the species we study in each category. Click on a species name to see what it looks like. How long have you been studying fish? Check out the NEFSC Historical Page to see how long we have been at it. Is life found at all depths in the ocean? The question was settled in 1960, when Piccard and Walsh reported a swimming animal, resembling a sole or other flatfish about a foot long, at 35,800 feet deep, observed from a porthole of the bathyscaphe Trieste. As recently as 1860, some scientists believed that marine life could not exist below 1800 feet. That view changed when a telegraph cable laid in the ocean bottom at 6000 feet deep was retrieved and found covered with many forms of marine life. What is the world's largest fish? What is the smallest? The largest is the whale shark, which grows to more than 50 feet in length and may weigh several tons; second largest is the basking shark, which may measure 35 to 40 feet long. The smallest fish is the tiny goby, an inhabitant of fresh-to-brackish-water lakes in Luzon, Philippines. It seldom is longer than a half inch at adulthood, yet is so abundant it supports a fishery. What is the most common fish in the sea? Any of the several species of Cyclothone, a deepwater fish sometimes called a "bristle mouth." Rarely visible at depths that man can readily reach, the fish is about the size of a small minnow. It is netted at 500 meters or deeper all over the world. Where can I find out about maintaining aquariums? Try FINS Fish Information Service, an archive of information about aquariums. It covers both freshwater and marine, tropical and temperate. How many fish species are there? The most often quoted estimate is 20,000. There may be as many as 20,000 more. Why do scientists classify fish? Which is the oldest fish, as a class? The most primitive fish-like animals are those with sucking mouths, such as lampreys and hagfishes, whose evolution stopped short of the development of biting jaws. Mainly bottom-dwellers, these animals are of great interest to zoologists, for many parts of their bodies show forms and functions that help to explain some of the evolutionary steps leading from low to advanced life forms. What is an anadromous fish? a catadromous fish? An anadromous fish, born in fresh water, spends most of its life in the sea and returns to fresh water to spawn. Salmon, smelt, shad, striped bass, and sturgeon are common examples. A catadromous fish does the opposite - lives in fresh water and enters salt water to spawn. Most of the eels are catadromous. What is the true description of a sardine? Commercially, the name has come to signify any small herring-like ocean fish. In the United States, it is mandatory that when the name "sardine" is used on a can, the country or state of origin be listed, and a statement must appear that identifies preserving and flavor supplements. Menhaden are silvery, herring-like fish that travel in large schools along the Atlantic and Gulf of Mexico coasts of the United States. Plankton-eaters, menhaden attain a weight of about three-quarters of a pound. Flesh is oily and considered inedible for humans. The fish are caught by purse-seine nets in shallow water and processed into oil for cosmetics and fish meal for animals, particularly for poultry. Menhaden support the largest fishery by volume and the eighth most profitable fishery in the United States. How many kinds of tuna are there, and which kind makes up the biggest catch? There are seven commercial and sport-caught tunas, as well as several related species, all of which are members of what is called the scombrid family. Commercially caught tunas consist of albacore, bigeye, blackfin, bluefin, bonito, skipjack, and yellowfin. Yellowfin, taken in the eastern Pacific and tropical Atlantic, makes up the biggest U.S. commercial catch. Albacore, caught in the eastern Pacific, is the true "white-meat" tuna; skipjack, caught throughout the world in tropical and subtropical waters, makes up the second largest U.S. commercial catch; bigeye is caught mostly in tropical waters; blackfin is caught commercially only in the Caribbean and off South America; the very large bluefin (rod-and-reel record, 1,040 pounds) is a highly prized sport catch in the Atlantic and Pacific; and the widely distributed bonito is used largely as pet food. What is the fish listed as "scrod" in New England restaurants? The name comes from a Middle Dutch word "schrode" meaning a strip or shred. In New England scrod may be small cod or haddock weighing 11/2 to 21/2 pounds. Sometimes the term is applied to cusk of about the same weight, or to pollock weighing 11/2 to 4 pounds. When fishermen use the word, they are usually referring to gutted small haddock. What is an "exotic" fish? One not native to an area, but introduced either by accident or design. Some such species can cause problems. Often their natural predators are absent from the new area, permitting more rapid reproduction rates than those of natural inhabitants, sometimes at the expense of more desirable native fish. The "walking catfish" in Florida is an example. 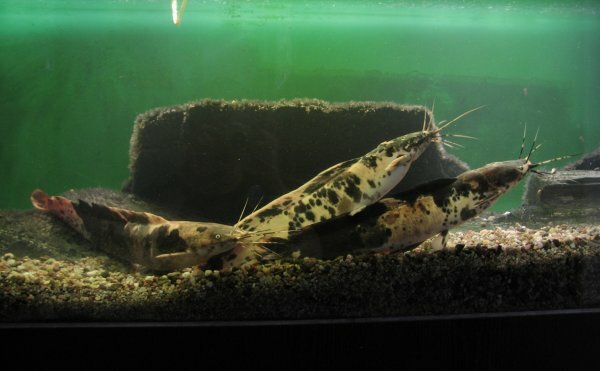 Thought to have escaped from a private aquarium, the catfish have shown a remarkable ability to avoid eradication efforts by man. An aggressive and voracious fish, it poses a threat to other forms of aquatic life. Population is now estimated in the millions. What fishes are named after other animals? Many fish are named after animals, including: alligator, bird, boar, buffalo, cat, cow, dog, elephant, frog, goat, goose, hawk, horse, eagle, leopard, lizard, parrot, porcupine, rabbit, sheep, pig, squirrel, hog, tiger, toad, unicorn, viper, wolf, scorpion, zebra, robin, and raven. Click on the images below to enlarge and see what the fish is called, or to see a slide show. What kind of fish is a "Bombay Duck"? Also called bummalo, Bombay Duck is a marine lizardfish from southern Asia, particularly abundant in the Ganges Delta and the Arabian Sea of western India. The ordinarily small fish is split, boned, and sun-dried, and used as a condiment. What are some confusing fish names? Do some fish give birth to living young? Yes, many do. These are called viviparous fishes. The sea perches of the Pacific coast, for example, give birth to living young of considerable size, sometimes one-fifth the size of the mother. Several kind of sharks produce living young. Either fish scales or otoliths (a.k.a earstones, small bones in the skull) are used to count growth rings. The rings correspond to seasonal changes in the fish growth and can be compared to the annual rings in tree trunks. Otoliths grow like pearls, but the added material changes color depending on the season, with the summer ring whiter and the winter ring thinner and more translucent. In scales, a series of fine rings are laid down as the scale grows. In summer, the rings are wider apart, but in winter, the rings are closer together as the fish is growing more slowly. Each pair of rings indicates one year. Here is how we age fish at NEFSC. How long do fish live? Orange roughy live over 100 years. In the Northwest Atlantic, the longest-lived fish is the Acadian redfish, which can live past 40 years. Longevity depends on species. Yes, but not directly into the lungs as mammals do, except for some tropical fish. Actually they breathe oxygen, not air. As water passes over a system of extremely fine gill membranes, fish absorb the water's oxygen content. Gills contain a network of fine blood vessels (capillaries) that take up the oxygen and diffuse it through the membranes. It all depends on what you mean by sleep. My dictionary says that sleep is a period of rest in which the eyes are closed and there is little or no thought or movement. That is, sleeping means closing your eyes and resting. The first thing we notice is that most fish don't have eyelids (except for sharks). Also, while some deep ocean fish never stop moving a great many fishes live nearly motionless lives and many do so on a regular diurnal/noctural cycle, some active by day others by night.. So we can't generalize and say that all fish sleep like we do. But most fish do rest. Usually they just blank their minds and do what we might call daydreaming. Some float in place, some wedge themselves into a spot in the mud or the coral, some even build themselves a nest. They will still be alert for danger, but they will also be "sleeping." How do fish swim? How fast? Primarily by contracting bands of muscles in sequence on alternate sides of the body so that the tail is whipped very rapidly from side to side in a sculling motion. Vertical fins are used mainly for stabilization. Paired pectoral and pelvic fins are used primarily for stability when a fish hovers, but sometimes may be used to aid rapid forward motion. Tunas and tuna-like fish, billfish, and certain sharks are the speed champions, reaching 50 miles per hour in short bursts. Sustained swimming speeds generally range from about 5 to 10 miles per hour among strong swimmers. A number can, but usually don't. Those that can are mostly members of one of the eel families. Do all fish swim in the horizontal position? Most do. The sea horse is among the exceptions. Another is the shrimp fish of the Indian Ocean, which congregates in schools of several individuals and swims vertically, its long tube-like snout pointing directly upward. A catfish indigenous to the Nile and other African rivers also swims in the vertical posture. Many kinds of midwater deepsea fishes swim or rest vertically. Do fish chew their food? Fish would suffocate if they tried to chew; chewing would interfere with the passage of water over the gills, necessary for obtaining oxygen. Carnivorous fish like sharks use their sharp teeth to seize and hold prey while swallowing it whole or in large pieces. Bottom dwellers such as rays are equipped with large flat teeth that crush the shellfish they consume. Herbivorous fish (grazers) often lack jaw teeth, but have tooth-like grinding mills in their throats, called pharyngeal teeth. Where are Atlantic menhaden spawned? Where do they go after hatching? Spawning takes place in the ocean. One important spawning site is at Onslow Bay, North Carolina. Some spawning takes place along the Atlantic coast from Massachusetts to Florida. The young menhaden first drifts with currents until it reaches an inlet, then works upstream to live for the summer near freshwater. In fall, schools move downstream to permanent ocean residence. Herring subsist on zooplankton. Herring, which populate the oceans in enormous numbers, play an important role in the oceanic food chain in that they are primary converters of plankton. Herring form the food base for many larger species, and enormous quantities are taken commercially for fish meal, human food and bait. Pearl essence is the silvery substance in the skin of herring and other fishes. Pearl essence is a lucrative byproduct of herring fisheries as it is essential to the manufacture of lipstick, nail polish, paints, ceramics, and costume jewelry. What is the largest sturgeon on record? 630 kg (1387 pounds), taken from the Fraser River opposite New Westminster, August 14, 1897. Most kinds encountered by anglers are. The organs of some species are always poisonous to man; other fish can become toxic because of elements in their diets. The latter are most often from tropical regions of both the Atlantic and Pacific Oceans. Scientific literature has pinpointed danger areas in which the disease called "ciguatera" (a disease dangerous to man) may occur in tropical and subtropical fish. What fish are sustainably harvested? For detailed information on fish species sustainability, see FishWatch. Will fish I catch and release die anyway? If fishes caught with artificial lures such as flies are handled carefully, most will survive. Apparently, many factors influence survival after release. If the fish was already stressed before being caught, for instance because of spawning or high water temperatures, it is less likely to survive. If the fish is "played" for a long time and is exhausted before release, it is probably less likely to survive. If the fish is hooked through a sensitive area such as the gills or the eye, or is hooked deeply in the throat (which seems more likely when using bait), it is less likely to survive. If the fish is handled roughly, for example squeezed strongly or held out of water too long, it is also less likely to survive. If a fish seems to be having difficulty after unhooking, cradle it gently in the water until it regains its equilibrium and swims off under its own power. Fish caught in deeper water are less likely to survive. Why is fishing sometimes called angling? You use a hook, or angle, to catch fish (as opposed to a net or your hands). How can poisonous fish be distinguished from edible ones? They cannot, without personal knowledge of the types of fish which are at times poisonous. Frequently local customs can be relied upon. A comprehensive three-volume publication on the subject is entitled "Dangerous Marine Animals" by Dr. Bruce Halstead. Are saltwater catfish good to eat? The two species of sea catfish caught in U.S. waters are edible. The gafftopsail catfish is considered more tasty than the smaller common sea catfish. Is there much salt in fish? Very little in most. More than 240 species contain so little salt that doctors recommend them in salt-free diets. Shark meat is salty - as salty as the sea the shark lives in. Why do food fish sometimes have a strong odor? For most species, truly fresh fish is almost odorless. Fish begin to smell "fishy" when deterioration sets in, often caused by incorrect storage practices that bring about the release of oxidized fats and acids through bacterial and enzymatic action. What is the blood-like material found along the backbone in the body cavity of most fishes? The kidney. It is usually removed when the fish is cleaned. A factory ship is a fishing vessel designed to catch huge amounts of fish. They have the ability to fillet and freeze fish immediately after they are caught. In an hour, one factory ship could haul in as much cod (around a hundred tons) as a typical boat of the sixteenth century could land in a season. Are the eyes of flatfishes on the right or left side? Both, but it depends on species. Two of the four flatfish families (tongue soles and turbots) are sinistral (eyes on the left side); the other two (both flounders) are dextral (eyes on the right side). Rarely, a fish will have the eyes migrate to the "wrong" side for the species; this happens more often in aquaculture. The Greenland Halibut has an eye on the edge of the body. How do porcupine fish inflate themselves? All puffer-like fish inflate by pumping water into special sacs when in their natural environment. Out of water, a puffer fills the sacs with air instead, and takes on a ballon-like appearance. Where can I learn more about endangered species? Visit the Endangered Species Home Page put out by US Fish and Wildlife. An awesome site! How much electricity does an electric eel generate? The average discharge is more than 350 volts, but discharges as high as 650 volts have been measured. Voltage increase until the eel is about three feet long, after which only amperage increases. Some South American eels measure 10 feet in length. Yes, all species do, but scales are so small over most of the body as to be nearly invisible. Prominent scaling appears only around the head, on the cheeks, and in a triangular area on each side of the body near the head. Has any kind of marine or ocean dwelling fish been successfully transplanted from coast to coast in the United States? Yes, larvae and juveniles of the shad and the striped bass were taken from the Atlantic and released in the Pacific in the 1870s. So successful were the transplants that shad became permanent inhabitants of waters from southeast Alaska to Los Angeles, and striped bass support a good sport fishery off the California and Oregon coast. How large do ocean sunfish get? All four species reach from seven to ten feet in length. Because of their tremendous weight, the fish are difficult to land and weigh. One accurately weighed specimen tipped the scales at 3,102 pounds. What are moray eels and where are they found? Moray eels belong to a family of fish which differs from the common eels by their lack of side fins, their well-developed teeth, and their lack of scales. Common eels have embedded scales, but these are not readily noticeable. Morays occur in tropical and subtropical seas of the world. In the United States. they are usually found in quantity only in Florida waters, although they have been seen as far north as North Carolina and even New Jersey. Little is known of their breeding habits except that the young pass through a stage which is very thin, ribbonlike, and transparent. Morays feed largely on other fish caught as they work their way through coral reefs. Some morays are equipped with teeth in the back of the mouth for crushing hard-shelled animals such as clams and oysters. Morays are occasionally caught on hook and line by fishermen, sometimes are captured by trawlers that drag nets over the bottom. People in some parts of the world value the moray as food. Some Pacific morays measure as long as 10 feet and are considered dangerous to man when aggressions are aroused, generally by divers' actions. Several records exist of attacks on humans by wounded morays. What exactly is Persistent Marine Debris, and why is it important? Persistent: 1. Refusing to give up or let go; persevering obstinately. This definition has a negative connotation, and in this case, very true. Debris: 1. The scattered remains of something broken or destroyed; ruins. So, working backwards to develop the definition; persistent marine debris is something broken or destroyed, located in the sea, that refuses to go away. This defines trash, not readily biodegradable, including metals, plastics, and rubber products. Metals and rubber products are serious problems but once in the marine environment, they sink to the bottom and pose less of a threat than the third item our list, plastics. The introduction of synthetic materials, or "plastics", is one of the most important technological advancements for modern society. The superior qualities of these synthetic materials make them an almost universal substitute for natural materials. However, it is these qualities - light weight, strength, durability, and low cost - which make plastics so prevalent and potentially damaging in the marine environment. This debris degrades coastal areas and injures or kills many marine animals including commercial fish and shellfish, birds, marine mammals, and sea turtles. It also interferes with vessel operations and safety by entangling propulsion and steering systems and may damage machinery by blocking seawater intakes.